This page contains the names of several people that planned to travel on the Titanic but for one reason failed to do so. Some had actually booked cabins and these are confirmed by their presence in an early passenger list. Others only appear in newspaper reports or family lore and are therefore harder to verify. See also Unlisted passengers and crew. BACON, Robert, wife and daughter. U.S. Ambassador to France, was delayed by late arrival of his successor, Myron T. Hendrick. Changed to the France, which departed France on her maiden voyage 20 April 1912. BILL, Mr. and Mrs. Edward W.
Mrs. Bill had a dream of Titanic being wrecked; they sailed on Celtic instead. Driving to Cherbourg, his car broke down and he missed the boat. However, his name remained on passenger list. His story was related in Walter Lord's The Night Lives On. (FROM OUR LONDON CORRESPONDENT). LONDON, Tuesday. Mr Norman Craig, K.C., M P., may be regarded as an exceedingly lucky person, for after booking his passage on board the Titanic; he changed his mind, and did not make the journey. Interviewed by our representative this afternoon, Mr Craig said that, as far as he could say, he had no conscious reason for delaying his voyage other than the fact that he considered that, in view of the present political situation, it would bettor for him to remain at home. "I was not going America on business," he said. "I was only intending make the run across and back for the sake of a health-giving outing." Of Winnipeg, Manitoba; canceled because illness forced him to take an earlier ship. Mr Alfred Franks of Edgbaston, Birmingham changed his mind after booking. A few days before sailing he took a boat from Liverpool instead.. Booked for suite B-52; canceled when Mrs. Frick hurt her ankle at Madeira on a cruise aboard Adriatic. Booked suite B-52 after it had been given up by Henry Frick and J.P. Morgan; canceled and took Mauretania instead. The Reverend J.Stuart Holden, rector of St. Paul's Church, Portman Square, London, was booked on the Titanic to sail from Southampton of 10 April 1912 , he is mentioned on the Herbert Cave Passenger List and would have occupied cabin D-11. Unfortunately for her, but perhaps fortunately for him, his wife fell ill before his departure and Rev. Holden cancelled his trip. His boarding card recently came to light in Liverpool. HOME, Thomas, brother in law to Major Arthur Peuchen was scheduled to sail on Titanic, but cancelled. He sailed on the Lusitania's last voyage. MADDEN, The Rt. Rev. T. J. Booked suite B-52. Was delayed by business (suite then booked by Mr. and Mrs. J. Horace Harding). Re-booked 10 April 1912 Titanic departure to 6 April 1912 Carmania departure because of family emergency. O'BRIEN, Mr. and Mrs. James V.
Were in Ireland because of a lawsuit, which lasted longer than expected. Had to switch to another ship. Booked to return on Lusitania, whose voyage was canceled by coal strike. Could not wait for Titanic, re-booked on Carmania sailing 3 days ahead of Titanic. The Thompson family had to cancel their Titanic trip when their son was badly hurt while playing. TURNER, Mr. and Mrs. George H.
Mr George Washington Vanderbilt (1862-1914), grandson of shipping and railroad magnate Cornelius Vanderbilt, and creator of Biltmore Estate in Asheville, NC booked to occupy a first-class cabin. However, they changed their minds at the last minute and sailed on the Olympic, but sent most of their baggage along with his personal valet Fred Wheeler, who boarded the Titanic as a second-class passenger at Southhampton. Wheeler perished in the disaster. It is not clear why the Vanderbilts changed their minds about sailing on the Titanic. According to a New York Times article dated April 30, 1912, they did so at the urging of Edith's mother (Susan Dresser), but since she had died in 1883, this cannot be correct. It is possible that the Times confused Edith's mother Susan with Edith's sister who bore the same name, but there is no way of knowing for sure. The Biltmore Estate Archives contains a letter from George Vanderbilt's niece, Adele Sloane Burden, expressing her relief in learning that her aunt and uncle had changed their minds and were safe. Early newspaper reports had placed Vanderbilt among the missing passengers. WOOD, Mr. and Mrs. Frank P.
The following 3rd class passengers had tickets from Queenstown but appear not to have joined. 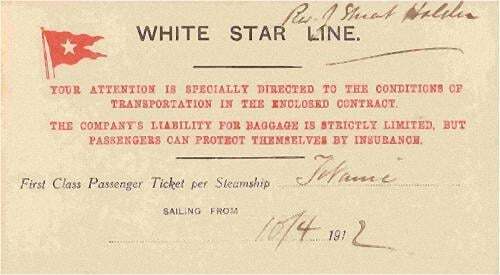 For more information on these see John P. Eaton (2008) Canceled Passages aboard the Titanic.